July was full of quilts & new customers & I had the opportunity to meet Amy. Amy made this beautiful quilt for a dear friend! Made from pre-cut fabrics, this quilt came together quickly for her & my goodness it’s striking in person! She decided to use the Ambrosia quilting design based more on the style of her friend’s home than the quilt itself, which is a brilliant idea! Sometimes we make quilts & the quilt itself does not “scream” to have a particular quilting design, but when we think about the quilt’s recipient, we are immediately led to the perfect design. I hope we’ve given you another tool to use when choosing your quilting design! I recently got a new laptop & so I’ve been going through files & came across a trove of pictures of quilts I’ve longarmed that never made it onto the blog. So over the next few weeks I’ll be highlighting some of these great quilts I’ve worked on for customers & charities. Today’s quilt is a great civil war reproduction quilt my customer made for an auction at the Micah House in Council Bluffs, Iowa. She chose the Arabesque panto & it was the perfect choice! Arabesque is a fairly dense small scale design which complemented the small blocks beautifully. It was impeccably pieced and a joy to quilt! 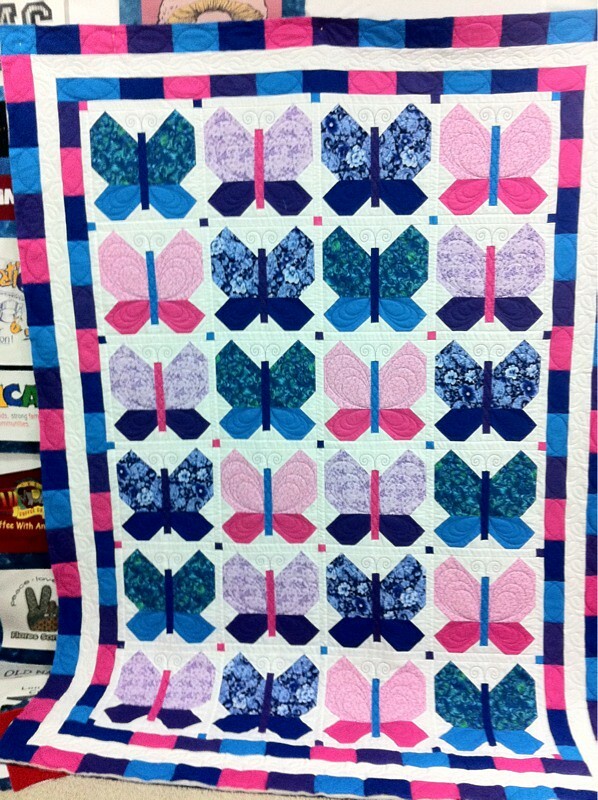 I hope whomever won this quilt is enjoying the talents of this piecer! Just wanted to let you know I’ve updated the photos on my Customer Quilts & Personal Quilts pages. I’m back home & getting settled- busy making lists & prioritizing all those things that need to be done. It helps considerably that the mornings now in Nebraska are cool (40s)- that’s the perfect energizer for me! Yes, I do realize I’m one of the few people in the world who gain energy from cold weather. Give me a snowy day & look out- who knows what will be done by the end of the day! Anyways, as much as I loved being with my family & all my nephews, it’s also wonderful being home & back in a routine. Getting my chores done this morning & planning on longarming this afternoon. Here’s a customer’s quilt I completed over the summer. It’s called the Scrap Assassin Returns. My friend is working on adding buttons to the centers of the flowers now. I can’t wait to see it when she finishes! I love the 1930s reproduction fabrics she chose for this quilt- I think I remember her saying she collected fat quarters for one year before started this project! One thing I have to say about this quilt- it is HUGE! It’s like 110something x 80something. Craziness! – Custom block quilting- so even though it looks like an overall repeating pattern, every flower was done individually. Hope you enjoyed the quilt! Have a great day! How We Are Like Quilts…. I love how they are far from perfect. I love how studying how the quilter “made it work” & improvised in the most creative ways! This year I was given the chance to complete a pieced top from a customer’s mother. She had put it together back in the 60s & it had been sitting my her daughter’s closet for who knows how many years. She gave it to me to finish. This top was partially machine and hand pieced. There are different shades of muslin. Every time the customer looks at this quilt, she thinks of her mother. So I had to work on this quilt. I believe that the reminders our quilts give others are the best compliments. We’re all far from perfect and some (ok, well most!) of us are a bit wonky & not all our color shades match, but we all do have the ability to provide warmth and love. About a week ago I thought I’d take my dentist’s suggestion & have my wisdom teeth removed. As I have not moved from this couch for 7 days, I am currently wondering the sanity of that decision, but alas things are starting to look up (just a bit) & I actually feel partially human (just partially). I have no current quilting to give you an update on, however there is a partially knitted cardigan (Rav link) I started which is now currently on hold because I discovered I cannot follow a simple lace pattern when my teeth hurt. Maybe I’ll pull it out later today as I do feel much better. However, I thought I would show you some pics of a quilt I did this past Spring for a customer. They are avid classic car fans & this quilt was actually a surprise for my friend’s husband! I used Munnich Design’s Jalopy Edge to Edge pattern, except to preserve the cars in the quilt top that were so carefully fussy cut, I made the pattern go around those designs. Definitely one of the more challenging pieces I’ve done, but I was glad I was able to preserve the classic cars in the piecing. Hopefully I’ll be back at this machine soon this week, with the holidays coming up quickly, there is lots of do! Have you noticed that my finished projects list (on right side of blog) has gotten a bit longer? I’ve actually finished two items! Granted they were the two UFOs closest to being finished & they are relatively small projects, but none the less they are done! Sadly, I done have any pics of those this morning. That would require getting up from the couch which would lead the cats to believe they are getting fed…and, well, since I think I can delay that another 30 minutes, sorry- no photos of those today. 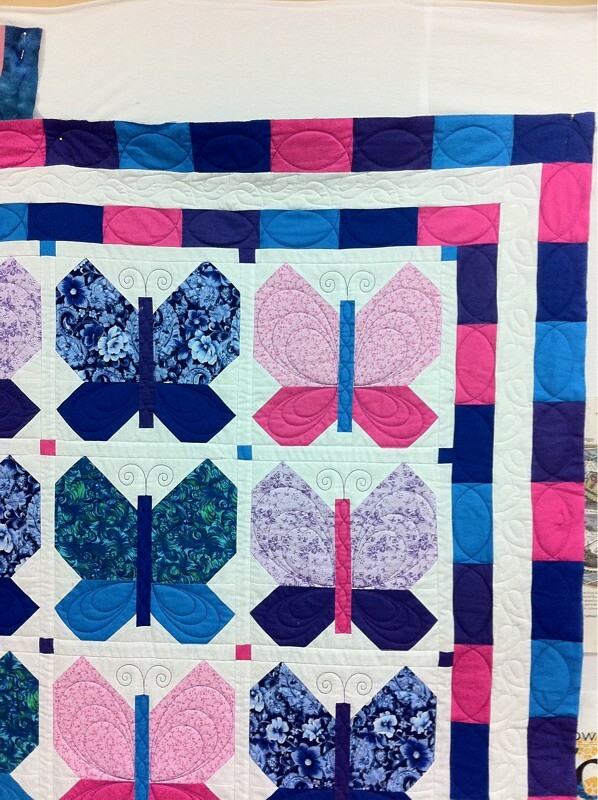 This has been my most challenging quilt to date- each butterfly wing & the body/antenna were done separately with a simple stitch in the ditch (SID) around the block with some playing around on the borders. Result- a very nice quilt I’m quite proud of! Tomorrow I’ll post another customer project- but I’ve had some questions about Pandora. It’s basically an online radio station that you can personalize. I like the Americana station & I can give a thumbs down or thumbs up to various songs- from this it actually generates more songs that it thinks I will like. So far the genre stations have worked out well- you can just enter an artists name & it will play songs it thinks are similar. I have not had good luck with this- I tried for Enya one day & the next thing I knew it was playing some weird piano gospel music. Still not quite sure how that’s related to new age celtic……. Ok, I’m off to make some more coffee get a move on! Hope everyone has a successfully creative day! I love days like today- it’s chilly out (therefore I have tons of energy), I have a whole day to myself to accomplish tasks and I’ve got the Pandora Americana station keeping me company in the background. Also the fact that I’ve completed my ENTIRE morning routine before 8 am helped too! So how are my goals doing? I’m going to try for a weekly update. 1. Cooking: yup- last week we made stromboli, homemade pizza and chicken curry. 2. Work 8 hours a day: yup- keeping good track of this. 3. Home Routine: yup- working very nicely & I have to admit our house looks pretty darn good! 4. Personal Loose Ends: this was a fail for the week- BUT, I went ahead & listed all of my personal UFOs (UnFinished Objects) over on the right side of the blog. Yes, the list is fairly long & there are probably more projects I need to add, but I’ve got a good starting point at least. So, now I’m off to the quilting machine- have a great day!